Boccia game is the game of balls which is played between teams and individuals. The game has been introduced to generate concentration, to be accurate on target and utilize the capability of humans. The disability sector has been working day and night to include the game in Paralympics, so that persons with disabilities irrespective of type of disability. 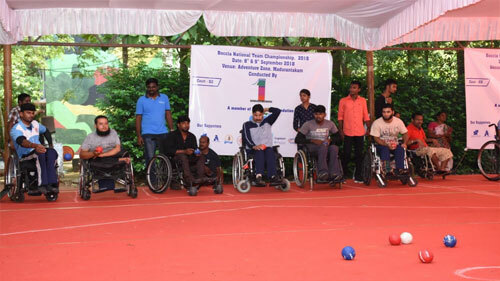 EKTHA a civil society organization from Tamil Nadu took initiative to conduct 1st National Boccia championship in Chennai. The Championship was held on 8th & 9th of Sept, 2018 at Adventure Zone, Madurandakam near Chennai. Humanity Welfare organization HELPline started boccia game among the children with mental disabilities. Around 30 children with different disabilities are already trained in boccia game. 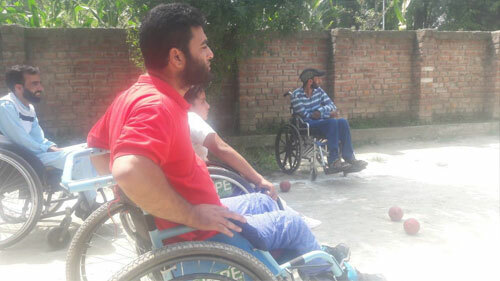 On 10 August 2018 EKTHA Chennai approached Humanity Welfare organization HELPline Kashmir to formulate two wheelchair users for participation in 1st Boccia National Championship in Chennai. 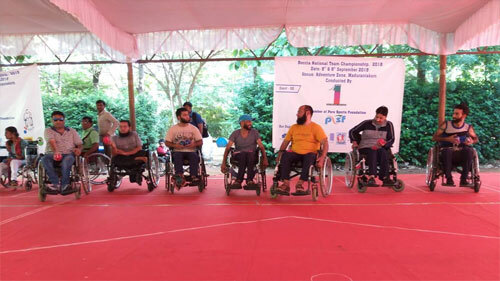 Two teams comprising of 4 wheelchair users each were comprised and were given rigorous practice in the game. The players did a lot of training at Bijbehara with the support of coach Gulzar Ahmad Malik & Naseer Ahmad Bhat. Dr. Syed Abid Rashid Shah, Deputy Commissioner Srinagar. 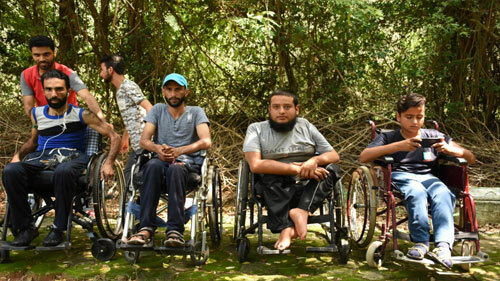 Eight wheelchair users from district Kulgam, Anantnag, Pulwama and Budgam. Two teams played eight matches, four matches were won. The overall performance of the players with disabilities was highly appreciative. Most of the players from our state were wheelchair bound and bed ridden. It was not possible for the players think of playing the sports and games and that too at national level. Although Humanity welfare Organisation HELPLine Bijbehara took the initiative but it was not possible without the support of above said donors. The highest support was given by HELP foundation NGO Srinagar. While playing the players competed with teams from: Assam, Tamil Nadu, Andhra – Pradesh, Orissa, Maharashtra, Punjab, Kerala, Madhya Pradesh, Gujarat, Delhi. Most of the team players from Jammu Kashmir were not been to other states and had never travelled independently before. They were highly enthusiastic to play the game outside. The challenge was use of washroom and travelling. As The air travel was easy and convenient. The wheelchair bound players could manage their travel for 10 hours. They all were jolly and while interacting with the other persons with disabilities from various states, they exchanged views and were relieved of so many agonies. Earlier the players were shy and not able to utter words but in three days they got inter mingled with the other players facing severe disabilities. 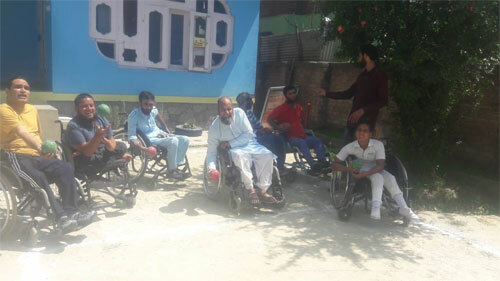 Some players gave them tips to use washroom at their own and propel wheel chair in rough terrains. The trip opened the supplementary ways to live a life with independence. The players who were fully dependent on the family members to live an independent life were roaming around in the venue with least support from the escorts. The use of washroom, shifting from bed to wheelchair and vice versa was at an ease. Life in accessible tents was a new experience. All the players enjoyed Chennai visit and roaming around in accessible buses along with the wheelchairs. 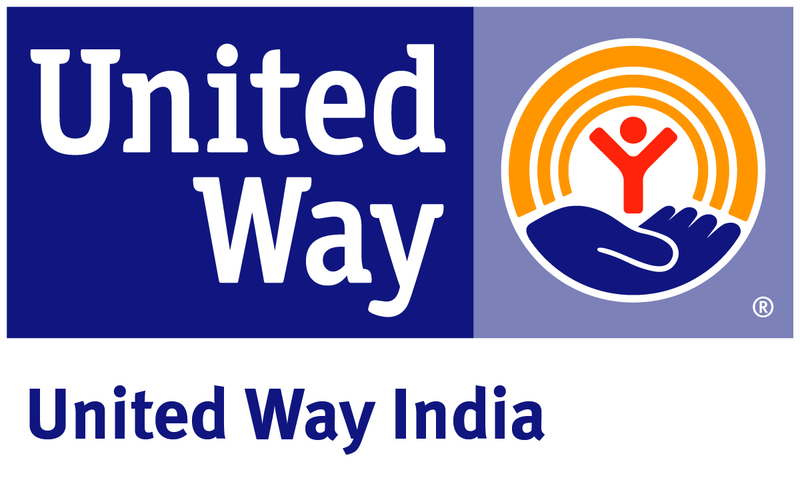 Way forward: Humanity Welfare organization HELPline NGO has been working tirelessly for the upliftment of persons with disabilities. A team of 10 students with mental disabilities have been established who are rigorously coached by Mr. Gulzar Ahmad Malik and Naseer Ahmad Bhat with support of Tariq Ahmad Rather, Abdul Hameed Itoo and Manzoor Ahmad Lone. 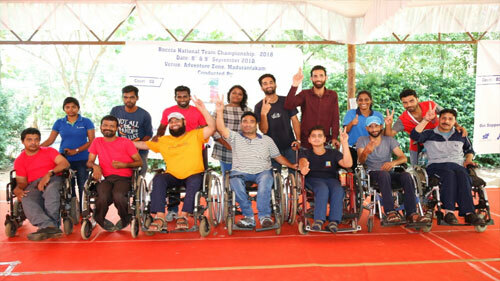 A team of 8 spinal cord injured youth bound to wheelchairs are also trained Boccia game. The game has opened doors for the inclusive sports concept and ended stigma that all cannot play because of disabilities. But Boccia game proved all can play, despite facing the disabilities. 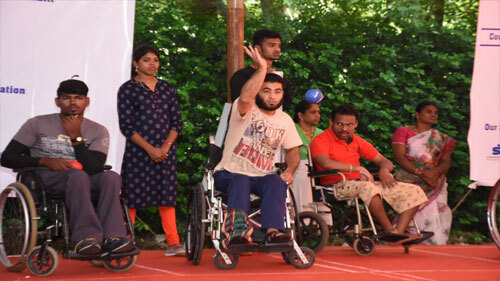 Humanity Welfare is fully supporting the plea that Boccia game should be added as game in Paralympics. We have been part of voice raised in this regard. We are thankful for supporters who made it easy for us to be part of game that too miles away. May our supporters be supported from treasures of Almighty Allah.